Almost 6.8 million people received federally administered payments in December 2002. The average monthly payment in December 2002 was $407. Total payments for the year were more than $34 billion, including about $4 billion in federally administered state supplementation. Fourteen percent were under age 18, 57 percent were aged 18-64, and 29 percent were aged 65 or older. Most (81 percent) were eligible on the basis of a disability. For those who had other income, the most common source was Social Security benefits (35 percent). Despite their disabilities, about 341,000 recipients (6 percent) were working in December 2002. Among working recipients, 99,000 had earnings above the substantial gainful activity level ($780 in 2002). Since 1974, the Supplemental Security Income (SSI) program has guaranteed a minimum level of income for needy aged, blind, or disabled individuals. 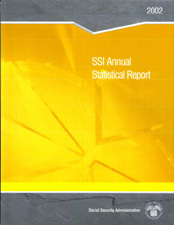 Each year, we issue a report that presents data on the SSI program and the people who receive benefits from it. The report covers such topics as federal benefit rates and total annual payments, federally administered payments, state-administered supplementation, work incentives, applications, awards, denials, and suspension of benefits. This edition has been expanded to include several topics of interest to policymakers. A new section on the outcomes of applications follows applicant cohorts over time to see how many undergo a medical review and what percentage of them are ultimately awarded benefits. The section on federally administered payments now includes a table showing country of origin of the nearly 1.5 million SSI recipients who were born in a foreign country. Finally, in response to numerous inquiries for data at the state level, we have provided state distributions for applications, awards, recipient rates, and receipt of Social Security and SSI on the basis of disability. Alfreda M. Brooks compiled the data and prepared the report for publication. Emil Loomis designed the cover, Laurie Brown and Celine Houget edited the report, Kathryn Winstead provided final production assistance, and Laurie Brown prepared the electronic versions for the Web. In July 2001, the Social Security Administration made retroactive lump-sum payments to correct an error in the cost-of-living adjustment for 2000 and 2001. The data in this report reflect the federal benefit rate actually used for SSI payments ($512 for 2000; $530 for January through June 2001). Numbers in the text and tables of this report may not add to totals because of rounding.